Bleeding, Teddy stood to address the crowd. "Friends, I should ask you to be as quiet as possible. I don't know if you fully understand that I have been shot, but it takes more than that to kill a bull moose." The crowd went silent at the revelation, and while getting weaker, Teddy delivered what might be his last speech. Overcoming severe asthma and a weak heart set young Teddy on a life course against the odds. 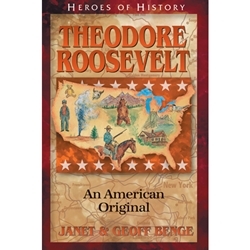 Whether rooting out government and corporate corruption, leading the legendary Rough Riders in war, establishing wildlife refuges and national parks, ranching in the Badlands of Dakota, writing books, or exploring dangerous uncharted land, the twenty-sixth president of the United States embraced every challenge and made his life count.